Welcome back, dear Readers! When last we saw the intrepid Clyde, he’d been left with a gaping wound in his side. Open to infection (or at least an invasion of squirrels) and mighty drafty, there he was! Well, the surgeon arrived, and his name is CHAD!!! We’d been working on this first corner (which is the right, rear, for anyone keeping score) for months now. Which sounds more pitiful than it is. Due to weather and scheduling, it’s been slow going! But, we’d had a couple of work days on this corner and it was going S L O W. Mainly because the original structure of the corner was pretty shoddy and rotten. So, we had to figure out how to rebuild it stronger, better, faster (wait, that’s the Six Million Dollar Man… not Clyde). And, our break-thru came yesterday! We finally figured out how to get the windows, the walls and the floor to play nicely with one another. Would the walls fit back together or had so much damage been done that we were going to need to reskin the corner? 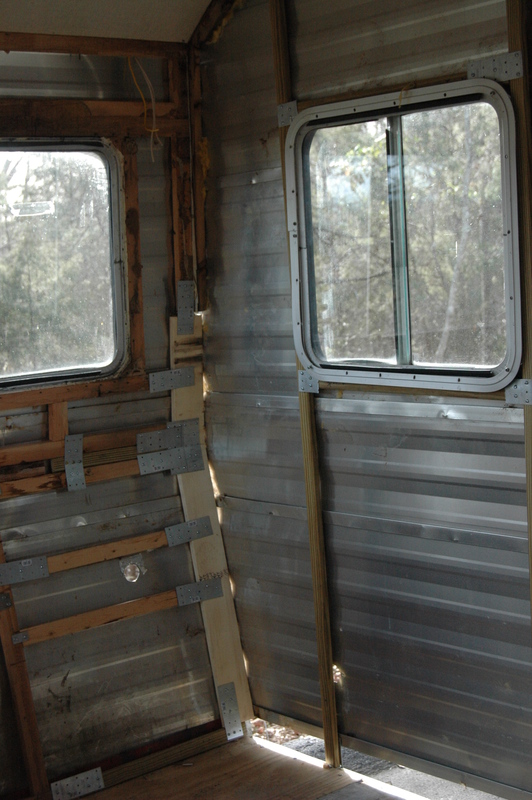 If we have to reskin, things are going to be MUCH more expensive, as it turns out old camper siding is quite expensive! Who knew?! 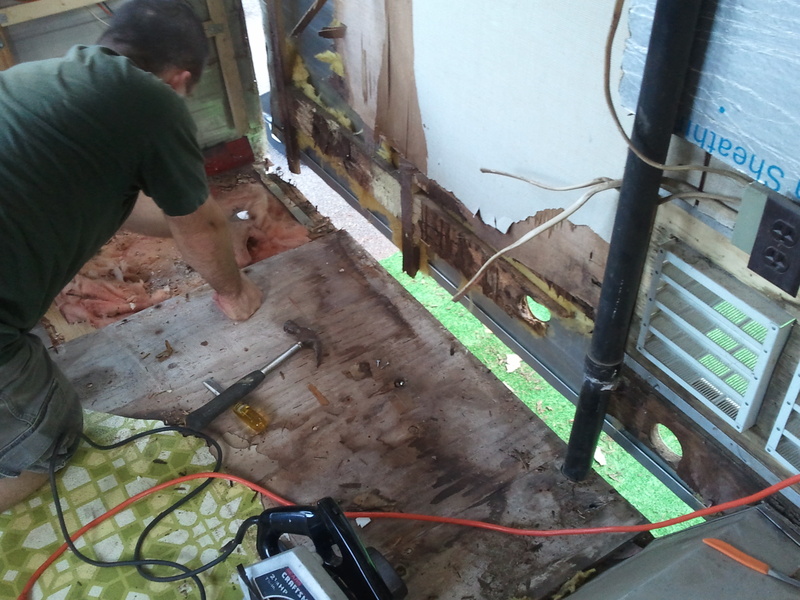 So, Chad rebuilt the corner, then we went outside and I helped him pull the metal back around and.. The corner, all buttoned up! IT WORKED!!! Everything lined up beautifully! We’ve got a few screws holding it together until we get some finishing nails and really get down to putting it back together for ever and ever. 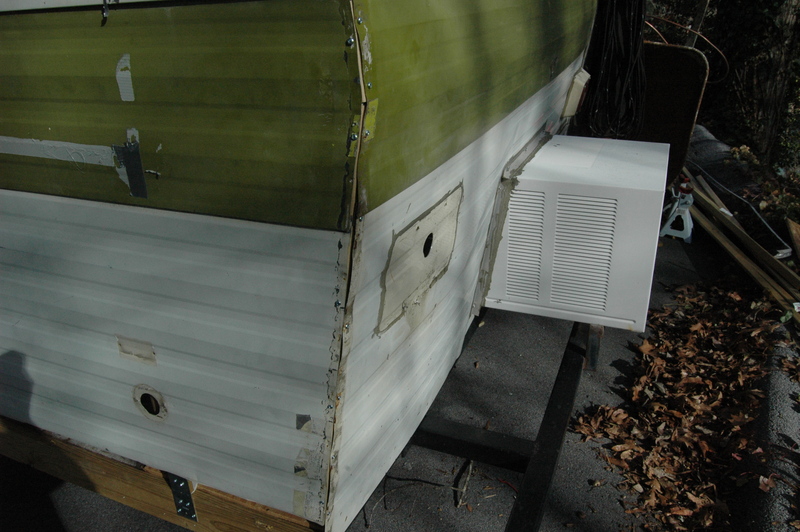 The original construction was held together with large staples, but camper siding is thick aluminum and we do not have a staple gun that strong. So, we’ll be going even more old school and using finishing nails! Now that we have a corner destroyed and rebuilt, we’re good to go. It took us much longer to figure out WHAT to do than it did to DO it. 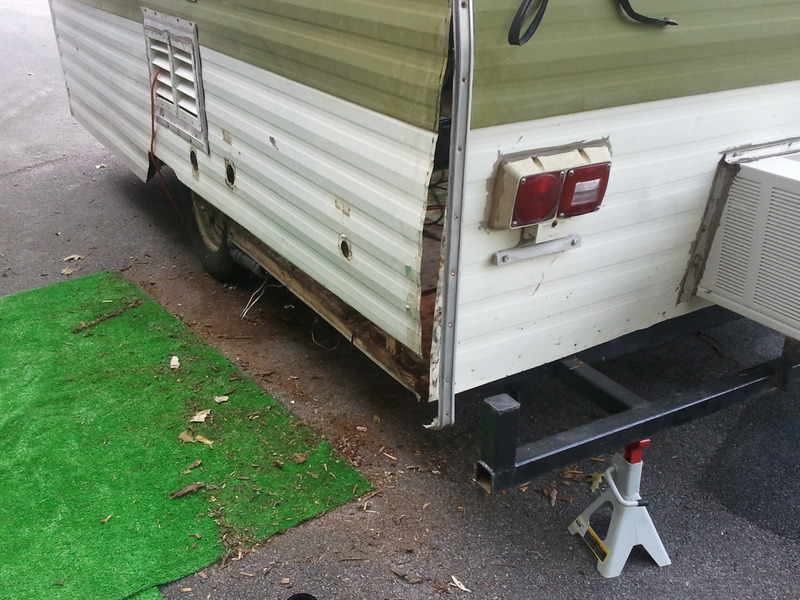 The other rear corner is next and should go a ton faster, now that we know what he heck we are doing! So, with the corner and buttoned up and pretty, we decided to try something else. For no reason whatsoever. 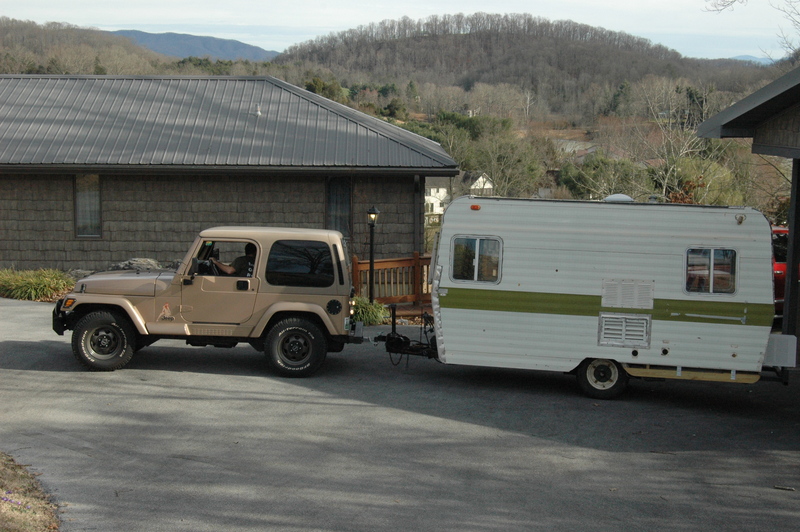 We’d finally gotten around to getting a hitch on the Jeep, so we wanted to see how it would do moving Clyde. As small as he is (and especially since he is currently pretty much gutted), it should be simple, but we wanted to check. So, we hooked the little guy up and took him for a short run across the driveway at Mom and Dad’s house. He did awesome and so did the Jeep! As simply as it moved Clyde, we should not have any trouble towing him loaded. So, another worry out of the way! YAY!!! I was sick as a dog this whole weekend, so I was little more than a glorified gofer (as in, gofer some lunch, gofer this and that). So, this one was pretty much all Chad. I was there for moral (or immoral, depending on how you look at it) support. And, in case you are wondering, yes, there is a strip off the bottom right outside. We’re waiting to see where we will run in the electrical and water to put that one back on. But, it’s rebuilt, just waiting the metal to go back on. We also made a really cool discovery. Clyde has had a rough life and I don’t think he’s had a wax job since the early 80’s. His paint is in awful condition and appears to be bone white with avocado green. Obviously, he will need to be repainted, and Chad and I decided we’d like to keep the Avocado, but change the main color to a rich, almond-like off-white. Yesterday, we pulled off a tail light (we will be replacing the ugly, boxy square ones with some retro-looking, round LEDs with flushmount and a cool chrome trim ring). 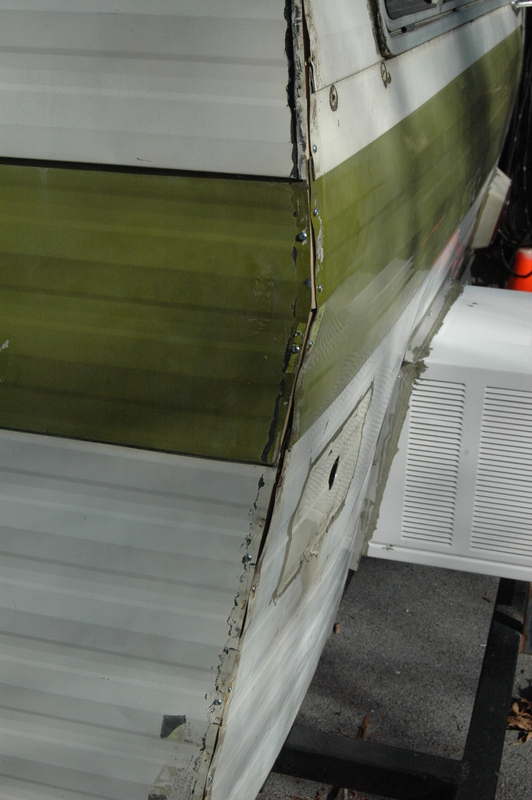 Under it, you could see what the original paint looked like. It’s ALMOND! The exact color we had discussed. It was so cool to know that we are so in touch with Clyde that we already seem to know what he needs to get back to being himself*! The original ugly tail light with what the paint looks like now. 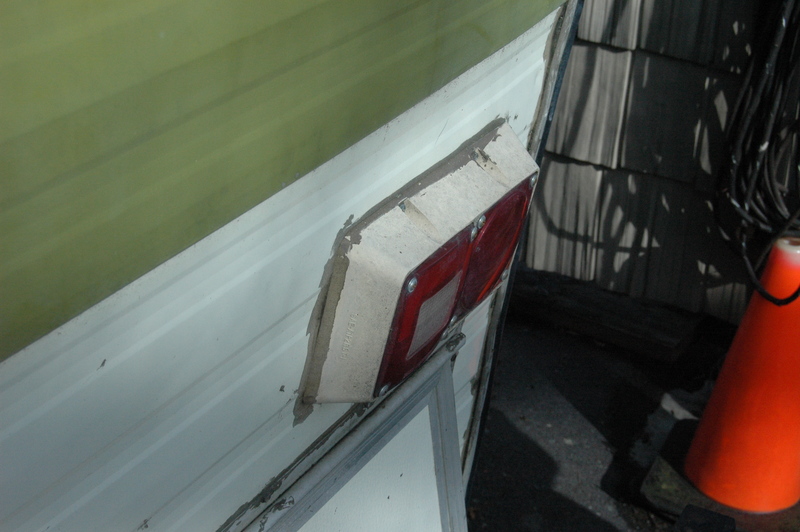 The small rectangle around the tiny hole is where the tail light was. Notice the difference in color! Coming up next: retro tupperware fest, AKA getting more STUFF for Clyde!